Rae at Mixology sent me 5 eyeshadow samples to try can you say *EXCITED*? .. Yulp! I am! These are the sample colors i was given : Top Left (Radiate Illuminizer) A beautiful sparkly pink It looks like a dull pink or white in the picture. But trust me. Its a pretty sparkly pink! 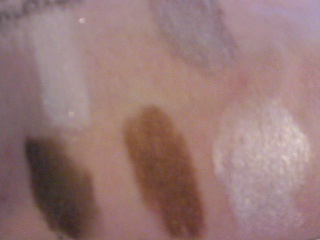 Top right : (Fray Eyes) a pretty creamy bronze color. Bottom Left : (Uminx) a pretty smoky dark ash color. Middle Bottom: (Starlight eyes) A shimmery dark copper with a hint of sparkle. and last but not least a beautiful shimmery pearl color. 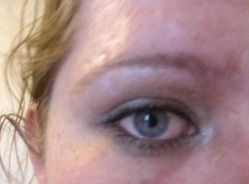 I used the colors : Uminex, Fray, Starlight, And Radiate Illuminizer to achive "My" smokey eye as seen in the picture. I didn't use any tools I only used the samples provided by Mixology and 4 cotton swabs. It only took a couple of minutes to achive this look using Mixology. Imagine what you could achive buying their eye shadows and actual tools! The shadows went on easy, With only a few smears here and there (It's powder makeup) but it was easy to clean up on bare skin.I only had very minimal eye irratation, Even while getting a little in my eye. I love mixology and so will you! Ingredients we use in our products are; Mica, Iron Oxide, Titanium Dioxide, Zinc, Silica, Serecite, Kaolin Clay, French Green Clay, Allantoin, & Ultra Marine Blue. ♥ I receive no monetary compensation for this review. I was provided mixology samples to try and give my honest opinion.